The Irish potato famine of 1845–49 is a famous example of international migration, when a large portion of a population move from one country to another. Of Ireland's population of 8.4 million, around 2 million, or almost one-quarter, emigrated. Today, there are 244 million international migrants, but for some countries, like Ireland in the 19th century, the number of people who have left is substantial. A recent study by the Pew Research Center, using 2015 data from the United Nations , shows that today, nine countries have lost a fifth or more of their population. One-third of those born in Bosnia-Herzegovina are now abroad, while 28% of Albanians and Jamaicans have also left their native home. In Armenia, one-quarter of the birth populations lived abroad in 2015. Meanwhile, one in five of the native-born population of Kazakhstan, Syria, Trinidad and Tobago, Macedonia and Portugal live in other countries. In some cases, the reason is obvious: conflict or physical danger are causing people to flee. Many born in Bosnia-Herzegovina left during the early 1990s when fighting broke out. Thirty percent, or 1.65 million citizens, left home. There have been other, more recent exoduses: 22% of (or 5 million) Syrians, have left since 2011, coinciding with the outbreak of civil war. Others leave in order to seek improved economic opportunities. For those suffering the Irish potato famine, the overwhelming majority fled to the same place: in this case, America. It’s a similar story for some of the other countries assessed by the Pew Center. For example, in the case of Kazakhstan, 63% of its emigrants lived in neighbouring Russia in 2015, while 83% of Jamaica's emigrants resided in either the United States or the United Kingdom. The majority of Portuguese emigrants are living permanently in places such as the US and Brazil. Some are less permanent moves: the majority of Syrian emigrants living in Turkey, Lebanon and Jordan would mostly likely be expected to return to Syria when conflict ceases. Emigration can have significant demographic effects on nations, argues the report. For example, many young adults have left Albania, while emigration is more common among more highly educated groups in Trinidad and Tobago. In some instances, out-migration among particular groups can exacerbate demographic imbalances, such as population ageing, and leave significant skill gaps within these source countries. The research focuses on those countries where the highest proportion of the population has emigrated. When looking at numbers alone, however, none of the countries feature in the top five. Those with the largest numbers of people not living in their birth countries are India (15.6 million emigrants), Mexico (12.3 million), Russia (10.6 million), China (9.6 million) and Bangladesh (7.2 million). 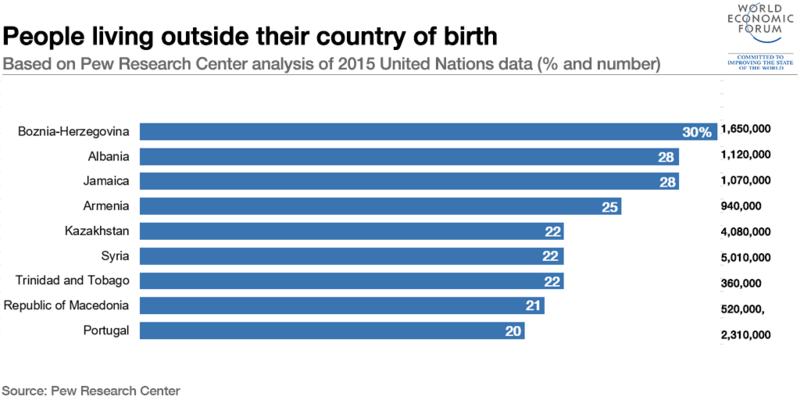 In terms of share of population, this represents only about 1% of Indian-born and Chinese-born people; 9% of those born in Mexico and 7% of those born in Russia live in different countries. The number of international migrants worldwide has continued to grow rapidly over the past 15 years, reaching 244 million in 2015, up from 222 million in 2010 and 173 million in 2000.